Herefish helps healthcare staffing firms keep up with the high-volume, high-touch demands of the modern health system. By enabling one-to-many communication, Herefish helps solve gaps and inefficiencies during the staffing process. Herefish takes all available credential dates from your ATS and can automatically send candidates reminders and alert recruiters to expiring credentials and more. The healthcare staffing market continues to grow and is expecting to rise another 5% in 2018. With the number of insured at all-time-highs, the demands of medical facilities increase; but relies on a short supply of professionals. With Herefish, your firm can improve communications with nurses, locum tenens and administrators by automating tedious tasks like credential gathering, re-deployment and engagement. Also, thanks to tight integrations with a firm's ATS, Herefish is able to monitor key dates like credential expiration, start dates and end dates so your staff won't be left managing this information on confusing spreadsheets or post-its. Most healthcare staffing firms deploy a credentialing team to constantly track down expiring credentials from active candidates. 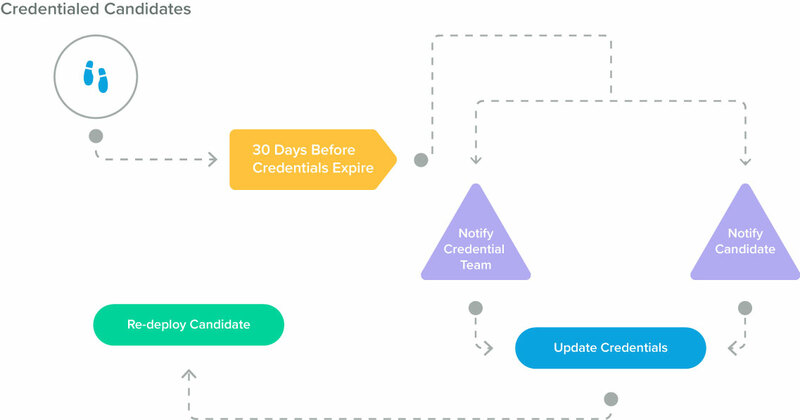 With Herefish, firms can automate this process by sending candidates and the credentialing team notifications before credentials expire.